On Clearinghouses Economics of Contempt. EoC and I are in an infrequent point of agreement here. I’ve never liked the idea of clearinghouses for CDS, not simply for the reasons he gives, but for the difficulty (read impossibility) of having counterparties post adequate margin (as in the product economics don’t work, so dealers will force inadequate margining). And he is right that not very liquid products are not well suited to central clearing (higher capital requirements and other forms of intrusive regulation are better remedies). Is It Really That Easy? Macro Man. Not sure I buy this, but who knows? The Euro/EU action seems the more logical perp, per David Merkel. Germany wants to have Greece aid off the summit agenda Eurointelligence. Huh? This entry was posted in Links on March 25, 2010 by Yves Smith. I don’t think we should have “networked mini cars” until after we get the gyrocopters and moving pavements I was promised in boyhood. First come, first served. Popular mechanics sure has some things to answer for eh. It would be sheer folly to rely on “smart regulation” going forward – yet Larry Summers and Tim Geithner seem to be taking that approach. Just answer this, preferably in public: What happens when another president with the philosophy of a Reagan or a Bush starts to make appointments? Exactly how is it possible to have more of a Reagan neoliberal trickle-down ideology and practice than Obama? and also elsewhere, Obama was telling the deepest truth about himself when he called Reagan his hero. It’s clear that his ambition for his presidency is to out-Reagan Bush by consummating the Reagan Revolution where Bush failed. Escalating Bush’s Bailout and war, and extending the Bailout to the insurance rackets, are just warmups for his most cherished dream: totally privatizing (destroying) Social Security. Why did President Obama go to the trouble of endorsing Mr. Volcker’s approach to limiting risk and size in the banking system, if his key implementers – led by Treasury Secretary Tim Geithner – were going to back down so quickly? Here, on the other hand, we have his spinelessness, his cowardice. Just like with Israeli settlements, Obama will once in awhile feel that for show he needs to pretend to do something good for once. But having said he would, he then caves in where he faces the slightest resistance. He’s too much of a coward to even keep up a pretense. The Fed’s argument is that any kind of size limitation would be too blunt an instrument – successful regulation requires nuance and subtlety. We know for a fact that only the bluntest, most brutal tools will suffice. We know that the most practical and moral solution is always simple and straightforward. And we know that anyone who wants to complexify and obscure things is just trying to enable and cover up his own crimes. Yes, yes…the first thing we’ll do, is kill all the lawyers! With all the black and white, it took me a while to see what was captured there. What an amazing unlikely event. Very nice. Do you know any back story — where, when, how? 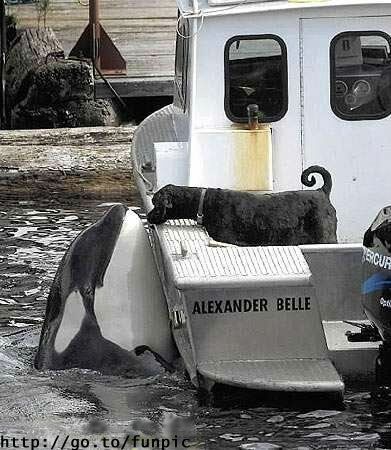 Looks like it might be Luna the solitary orca, killed in a boating accident a while back. I’m not sure what the Huh is for. Pretty clearly, if it can be put off the agenda, then the summit will not give any aid to Greece, which is Germany’s objective. So it looks like a shrewd move on Germany’s part. That can’t be right. It shows ME below EE. Well, let’s look on the bright side. These are all averages so it’s very possible to be offered significantly less. Summers left out biomedical and nuclear engineering. With good reason because these two would tend to defeat his thesis. The first is growing rapidly. And the second will be growing rapidly in those nations planning for real futures. If I knew Biomed paid that well, I’d have probably gone into that field. I think Nuclear may be underpaid because almost all nuclear engineers work for utilities (or the military), but I could be wrong. I remember thinking that was also an incredibly interesting field; unfortunately (for me), not too many schools teach it. You didn’t choose the wrong major because, luckily, people do their real learning after graduation. But colleges and universities are still responsible for their defective Ph.D.’s, MBA’s, etc. And in the biggest cover-up of all time, they refuse to recall their defective graduates. That, I believe, is the root cause of our problems today, along with greed and ego, I suppose. When existing home prices fall significantly below construction cost, as prevails now in almost all of Florida and many other areas, the construction of new homes effectively ceases. In these circumstances mortgages for new construction will be almost unobtainable no matter how good the borrower’s credit. The reason is the “appraised” value of the project will always be far below the mortgage sought. The buyer will have to put up 35% and more cash to generate acceptable LTV percentages. For a practical example let’s look at North Port, in southern Sarasota County Florida. As early as May 2007 the Financial Times described Sarasota County as the epicenter of the mortgage crisis. (I hasten to add I happened to get a free F-T copy reporting this while passing through Moscow, Russia. And I read it in a room whose window overlooked one of Vladimir Zhirinovsky’s buildings. A poetically appropo spot). This 2007 report was in order since North Port was previously an epicenter of r.e. bubble construction. In the last two years North Port has had multiple months when no new construction permits were issued. The next part should be obvious to any “economist” or “trader” who ever bought anything in Home Depot or Lowes: New home construction does not occur at all points from 0 to infinity on a Cartesian price graph. New construction only occurs when Price > Cost. When Price new home cost. This shows where existing home prices have to go. This is up to at least 90% of new construction price. And that assumes we can depend on buyer behavior last cycle when enough people were willing to a pay a 10% premium for “new”. In practice I expect that existing home prices will initially have to surge well above new construction costs. Residential financing and construction itself are now deemed to be as risky as writing naked puts and calls on biotech or gold mining stocks. We’ll need a strong smell of profits to entice players back to this particular sector. You are obviously right, but you’re forgetting one type of ‘new home’ construction! As for the X-Woman, I wonder if she has anything to do with the Alma legend told in Central Asia, Mongolia and Siberia. Probably not, Alma legends like Big Foot stories are fairly universal and similar suggesting another mechanism at work The description of “wild men” in Europe meet the standard Big Foot fair. Its more likely that like alien abductions there is something screwy with our heads which leads many people to claim they have seen some kind of sub-human creature. Perhaps its a left over survival mechanism, but the various legends of sub-human types are world wide. People who have never heard the various stories will report having seen the something very similar to a Yeti, Big Foot, Swampman, Skunk Man, etc. (Big Foot has been “seen” in 49 of the states. Hawaii has their own thing. On the other hand, maybe it’s all “real” — in a way that science has yet to comprehend. Check out Jacques Vallee’s “Passport to Magonia”. By the way, he’s a French astrophysicist and information theorist, as well as Silicon Valley IT entrepreneur. Very far cry from being a loony. I didn’t mean to imply that Big Foot sighting can only be attributed to the “loony.” The sightings aren’t limited to the loony. Its just that there is no evidence of the existence and its world wide phenomenon suggesting that something is obviously happening and its in our heads. I think there is considerable evidence that people believe they actually see something. At the same time, they can find plenty of evidence of one little monkey down in Tampa. If the sightings were isolated to a few regions (i.e. Pacific Northwest and Tibey, there is a possibility they just haven’t been found, but the ape-like appearance enters into the sightings after they found gorillas. The descriptions have changed over the years suggesting popular culture has changed what we see. For example alien abductees report experiences very similar to people in the Middle Ages in Europe who claimed to see the gates of hell open. The emotional experience and physical trauma are very similar as well as seeing two kinds of aliens or demons. Its just spaceships have replaced hell and aliens have replaced demons. Regarding the FT article, I agree; it’s time to stop punishing the prudence or as I recently put it, let’s stop robbing the responsible. Apologize to and compensate victims of today’s needless and artificially induced near zero percent interest rate policy. The economy suffers as a result of that bad policy too, as the interest money that used to be spent on junk and stuff has simply vanished into thin air – the same thin air out of which, the Fed, using its power of creatio ex nihilo, and at the same time commiting a supreme sacreligious act as it usurps the power of the Omnipotent One, conjures up money in the first place. Where does that 400 billion to the AMA show up? not in the CBO score. we are on a cash basis now. watch the difference between what they borrow on the market, and what they state the deficit is, and watch the physical dollars printed. pay cash to doctors who only take cash. Cerberus buys Caritas hospitals… interesting timing now that the health insurance bailout bill has been passed, the stage is set for more looting.